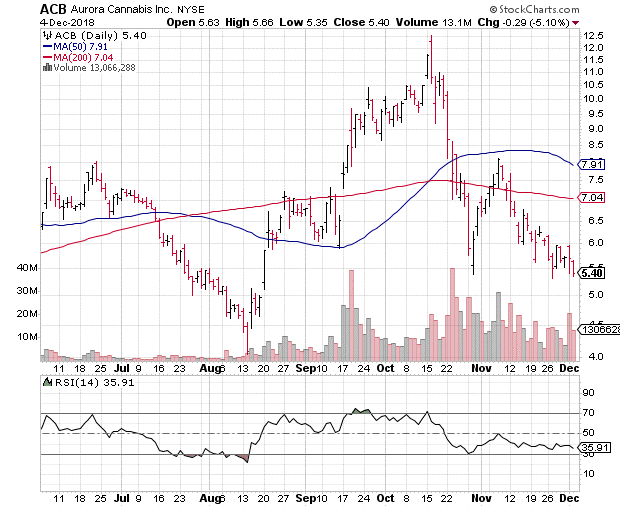 Back on Oct. 19, I warned that shares of Aurora Cannabis (NYSE: ACB) were trading too high heading into their NYSE listing. The stock was riding high on the Toronto Exchange after a bullish wave swept pot stocks higher in the wake of Canada’s legalization. The NYSE listing was just another log of hype to throw on the fire. Turns out, I was right. ACB stock plummeted from a high near $12.50 to a low of $5.39 by Oct. 30. Driven by panic selling in October, the pot bubble, it seemed, had finally burst. However, ACB’s descent appears to have finally slowed. The shares are finding support in the $5.30-$5.50 range — down about 129 percent from their October highs. Aroura’s 14-day relative strength index also is hovering just above over-sold levels, indicating ACB shares are oversold. All Aurora needs is a catalyst … and Sen. Mitch McConnell, R-Ky., is about to give it one. On Sept. 30, the 2014 Farm Bill expired. That bill included, among other things, provisions for certain states to grow hemp for scientific testing. Sen. McConnell’s home state was among those looking to grow hemp for industrial and textile purposes. With a budding industry now underway in the Bluegrass State, McConnell has now set his sights on making hemp legal across the board. In fact, the 2018 Farm Bill even modifies the Controlled Substance Act to specifically declare that hemp and marijuana are not the same. Aurora Cannabis now has an “in” for the U.S. market with hemp. Now, the hemp market isn’t quite as big as the marijuana market, but $820 million (the value of the U.S. hemp market last year) is not too shabby. However, with hemp comes cannabidiol (CBD) — a non-psychoactive derivative of hemp that has significant health benefits. Analysts project the CBD market could surge to $22 billion by 2022 once hemp is officially legalized in the U.S. In anticipation of this, Aurora has already made several hemp-related acquisitions. In May, the company boosted its stake in Canadian hemp grower Hempco to more than 50 percent. Once again, in September, Aurora bought Europe’s largest hemp grower Agropro as well as its sister processing and distribution company Borela. All that’s left now is a Congressional Budget Assessment, a vote and the president’s signature. This may be the last time you see Aurora Cannabis stock in the $5 range for quite some time. Editor’s note: Keep scrolling down to read more investment tips from Thomas Lancaster on Money & Markets.